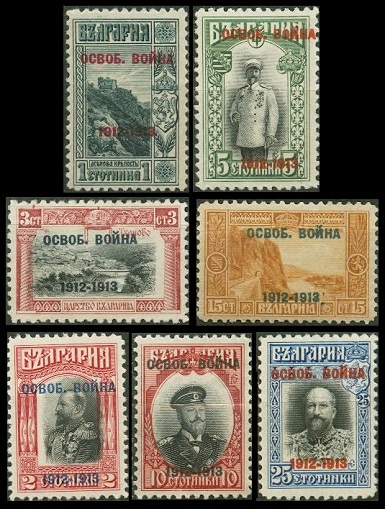 The commemorative Bulgarian stamps of 1912 to 1919 celebrate the reign of Tsar Ferdinand, the end of the Balkan War, the accession of Tsar Boris III, and the National Assembly in Sofia. The three portrait commemorative stamps shown above (Sc. #101-103) were issued on August 2, 1912 to celebrate the 25th Anniversary of the Reign of Tsar Ferdinand. The common design features a portrait of Tsar Ferdinand. 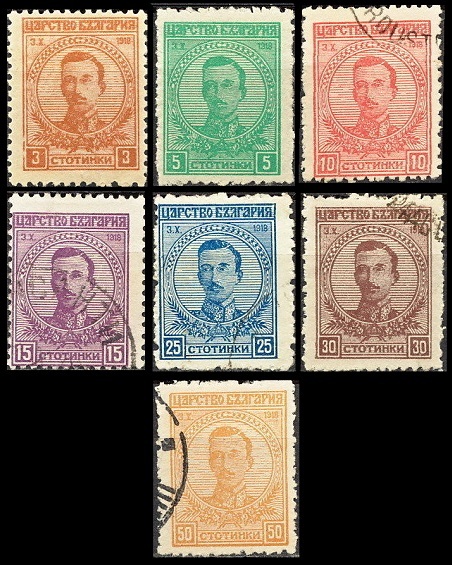 The seven overprinted pictorial definitive Bulgarian stamps of 1911 shown above (Sc. #104-111) were issued on August 6, 1913 to celebrate the Victory over the Turks in the First Balkan War. The overprint reads "освоб[одителна] война / 1912-1913", meaning "WAR OF LIBERATION / 1912-1913". The basic designs of these pictorial definitive stamps are as follows. 01 S. - Tsar Assen's Tower. The fortress of Tsar Asen II (Reigned: 1218-1241), who reigned during the Second Bulgarian Empire. The Church of the Holy Mother of God is all that remains of the original fortress today, and it is still in use, as a Bulgarian Orthodox Church. 02 S. - Tsar Ferdinand. 03 S. - City of Trnovo. The city, now known as Velìko Tǎ́rnovo, is famous for its many churches and for being the residence of the Bulgarian nobility during the Middle Ages. 05 S. - Tsar Ferdinand. 15 S. - Isker River. 25 S. - Tsar Ferdinand. The First Balkan War was fought between the Balkan Alliance and the Ottoman Empire during 1912 and 1913. The war was an overwhelming success for the Balkan Alliance, resulting in the loss of almost all the Ottoman territories in Europe and the partitioning of Southeastern Europe into sovereign nations. 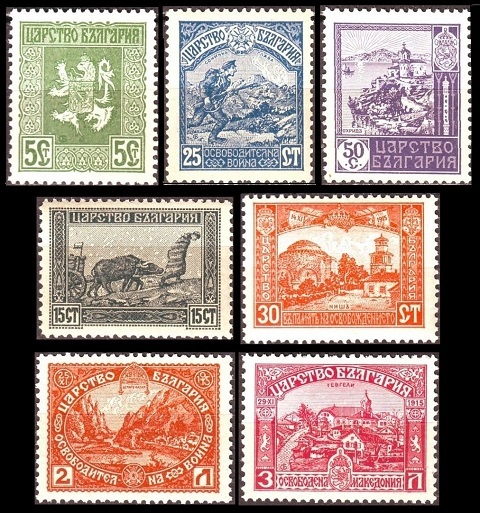 The seven commemorative Bulgarian stamps shown above (Sc. #122-127) were issued between 1917 and 1919 to celebrate the Liberation of Macedonia. The stamp designs are as follows. 05 S. - Coat of Arms. 15 S. - Peasant and bullock. 25 S. - Soldier and Mt. Sonichka. 30 S. - View of Nish. The city, founded in 279 B.C., was part of Serbia, when World War I began. It was conquered by the Central Powers and ceded to Bulgaria during 1915. After World War I, the city was returned to Serbia, and today, it is known by the name of Niš. 50 S. - Ohrid and Lake Ohrid. At the beginning of World War I, the town was part of Serbia. Macedonian revolutionaries rebelled against the Serbians, and the city was occupied by Bulgaria from 1915 to 1918. After World War I, Ohrid became part of the Kingdom of Yugoslavia, and today, it is part of the Republic of Macedonia. Demir Kapija, the town is located in the Republic of Macedonia. Demir Kapija is named for the limestone cliffs (of the same name) near the entrance to the town. 03 L. - View of Gevgeli. The town, now called Gevgelija, is located on the Vardar River in the Republic of Macedonia. The Liberation of Macedonia, as it is used here, refers to the Bulgarian military intervention, on the Macedonian Front, during the Central Powers' invasion of Serbia in World War I. Serbia was again liberated by the Allied Powers, at the end of World War I. 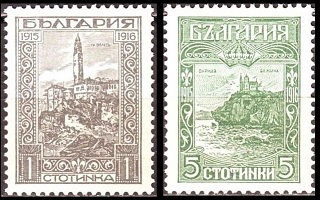 The three commemorative Bulgarian stamps shown above (Sc. #128-129, #134) were issued in 1917 and 1918, as an extension of the Liberation of Macedonia stamps of 1917. 01 S. - View of Veles. This ancient town is now located in the Republic of Macedonia. During its Second Millennium history, the town has been part of the Byzantine Empire, the Second Bulgarian Empire, the Kingdom of Serbia, and the Kingdom of Yugoslavia. 05 S. - Monastery of St. Clement (St. Panteleimon) in Ohrid. This 9th Century monastery is believed to have been founded by St. Clement, following his arrival in Ohrid. During the 15th Century, the monastery was converted to a mosque by the Ottoman Turks, and it is still used as a mosque. 01 S. - Plowing with oxen. The four portrait commemorative Bulgarian stamps shown above (Sc. #130-133) were issued on July 1, 1918 to celebrate the 30th Anniversary of the Reign of Tsar Ferdinand. 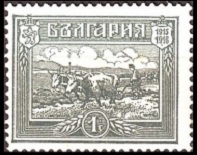 The two pictorial Bulgarian stamps shown above (Sc. #135, #137) were issued on October 3, 1919 to celebrate the 35th Anniversary of the Parliament Building in Sofia. The common design features a view of the Parliament Building, also called the National Assembly Building, in Sofia. The seven commemorative Bulgarian stamps shown above (Sc. 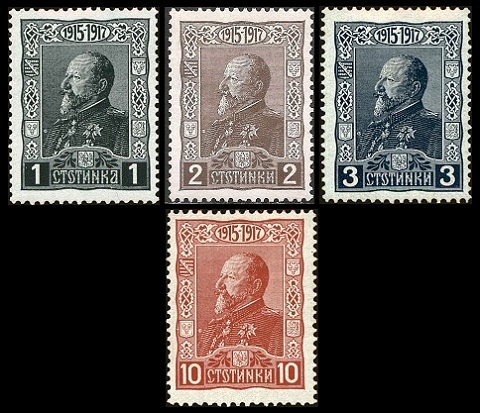 #138-144) were issued on October 3, 1919 to celebrate the 1st Anniversary of the Accession of Tsar Boris III.